The underground mine first began in 1919 as the Cayuga Rock Salt Company located just north of Ithaca under Lake Cayuga. Cargill Inc. acquired the mine in 1969 and has been the sole owner ever since. FUN FACT : The year round temperature in the mine is approximately 72 degrees. The mining method is very similar to coal mine panels with one big exception the size of the workings. This salt mine workings are 42 ft wide by 10 ft high. The No. 4 salt bed was one of the original sections of the mine worked from 1925-1969. The No 4 bed had 2 shafts at a 1,930 foot depth. This level also relied on a narrow gauge railway line to transport the salt to the skip hoists that took the mined product to the surface. The No. 6 salt bed had a 3rd shaft sunk in 1976 to a depth of 2,300 feet. Mining began on this level in 1969. In order to transport equipment between the 2 levels two 15 degree internal slopes were built connecting the levels. 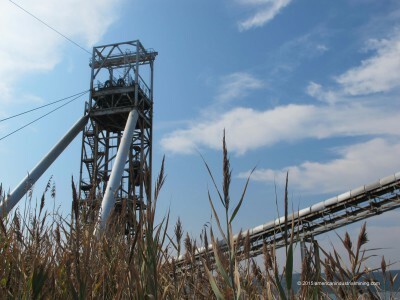 Our team worked with the staff at the Cayuga Mine to have several pieces of mining equipment brought to the surface. Our restoration team restored one of the original haulage mine locomotives that would be placed on display in front of the mine office at the Cayuga Mine. Yearly the miners produce a remarkable 2,300,000 tons of salt with approximately 160 employees working around the clock 5 days a week to make it all happen seamlessly. No 4 Salt Bed Depth 1,930 ft.
No 6 Salt Bed Depth 2,300 ft.
No 4 salt bed mined utilized an open stope method. Following the rolls of the salt bed. No. 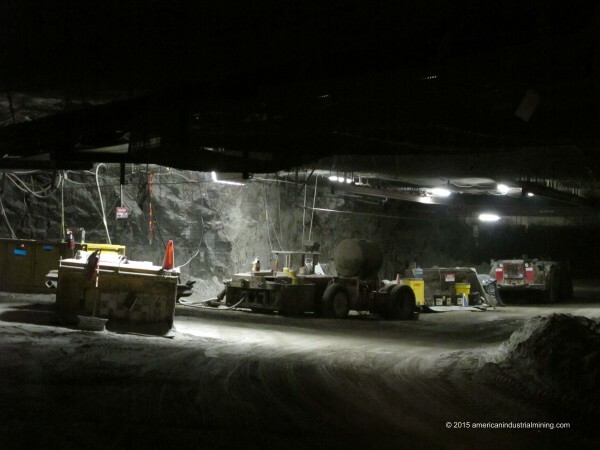 6 salt bed is mined in a highly mechanized manner utilizing face drills & blasting methods. The salt is transported to the crusher underground by low profile rubber tired loaders to expedite the mucking process.